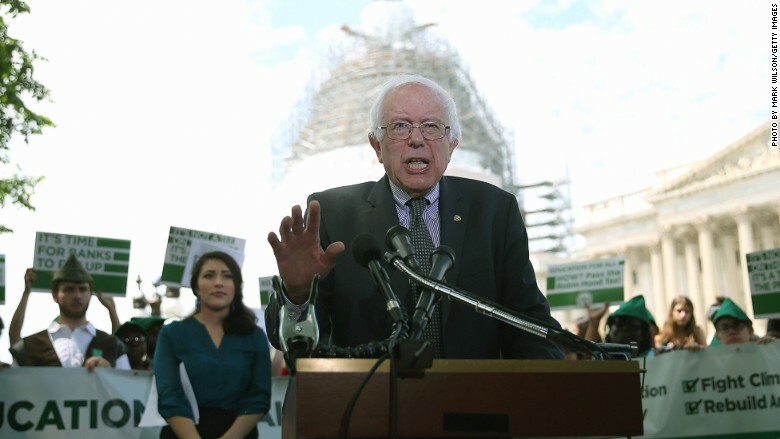 Lots of politicians talk about the widening gap between the rich and the poor, but Sanders is the 2016 presidential candidate offering the most aggressive -- and some would say radical -- plans to narrow the gap. At this point, the Democratic candidate has virtually no chance of winning the White House. But don't dismiss his ability to influence this pivotal economic debate by preventing frontrunner Hillary Clinton from tacking too far to the center. "He's very clearly staked out a populist position. He's really prepared to confront Wall Street and other industries with the idea of helping the bulk of the population," said Dean Baker, co-head of the left-leaning Center for Economic Policy and Research. Sanders is a long-time politician from Vermont who has been in the U.S. Senate since 2007. While he's running for president as a Democrat, he is listed on the official congressional roster as an independent. He describes himself as a "democratic socialist" -- one who wants "political revolution." So what would a Bernie Sanders economy actually look like? Free college! There's nothing subtle about this plan to even America's playing field: Sanders wants to make public colleges free -- for everyone. Tuition costs have skyrocketed, creating a situation where people get left behind in the economy because they simply can't afford college. Many people who do go to college are saddled with hefty student loan payments -- a $1.2 trillion problem that may be hurting the housing market. Less controversially, Sanders wants to lower interest rates on federal student loans and prevent the government from profiting off student debt. How does he want to pay for this? The Vermont senator wants to tax Wall Street, of course. He proposed a so-called "Robin Hood tax" on trades of stocks, bonds, options and futures. It's easy to see how these proposals would run into severe opposition from the financial industry as well as the private universities that could be put out of business. Related: Bernie Sanders' education plan: Free college! Break up the banks. Speaking of Wall Street, Sanders wants to dismantle its biggest players. That means shrinking big banks like JPMorgan Chase (JPM) and Bank of America (BAC) that Sanders and others believe present too great of a risk to the financial system -- and thus taxpayers (see: TARP, 2008). "They are too powerful to be reformed. They must be broken up," Sanders declares on his website. This won't go over well with the likes of Jamie Dimon, the JPMorgan chief who already feels his bank is "under assault" by regulators. The Sanders approach is a big contrast with Hillary Clinton, whose husband signed legislation that allowed banks to get bigger. The former first lady has also raked in big speaking fees from big banks like Goldman Sachs (GS). Instead of bailing out Wall Street, Sanders wants to deploy public funds towards "repairing Main Street." Specifically, he's calling for the U.S. to spend $1 trillion over five years to revamp America's dilapidated infrastructure. $15 minimum wage: One way to help struggling workers is to raise the minimum wage. While Clinton has been quiet about how high the minimum wage should be, Sanders is going all in by pushing for a $15 minimum wage. Of course, many businesses would argue that is too aggressive in today's slow growth environment. Wal-Mart, (WMT) America's largest private employer, is already warning investors about how its pay hike is denting profits. Tax the rich. Sanders needs a lot more revenue to pay for his progressive policies. He recently told CNN he "absolutely" wants to raise taxes on the "very wealthiest" Americans. It's not clear precisely how high Sanders wants to raise taxes on the rich, but the senator's website calls for a "progressive tax system" that is based on "ability to pay." Yet raising the top tax rate too high could backfire if it hurts investment or encourages wealthy individuals to evade taxes altogether. "I'm not a fan of raising taxes for the sake of raising taxes," Baker said. Less globalization: Sanders believes NAFTA and other trade deals were "disastrous" agreements that have hurt the middle class. That's why the senator has called the Trans-Pacific Partnership trade deal championed by President Obama and Republicans a "terrible idea." "He thinks trade and globalization hurt average Americans," said Robert Shapiro, a senior fellow at Georgetown's McDonough School of Business. While there may be costs to globalization, "any kind of protectionism would end up costing the entire country a lot more," Shapiro argues. Too radical? Some of Sanders' proposals will be seen as too far to the left for many Americans, especially those who think the current president is already a socialist. And his tough stances on Wall Street, Corporate America and the rich will diminish his ability to raise money from these powerful constituencies. But Sanders is fine with that. Just look at the tagline on his website: "Paid for by Bernie 2016 (not the billionaires)."